The Hagstrom Super Swede, built from 1979 until Hagstrom closed in 1983, was the last of the top quality guitars from the venerable Swedish builder. The original Swede used a bolt-on neck, and one of the Super Swede’s upgrades is a set neck. This Super Swede dates to 1983 at the Hagstrom Alvaden plant, and features a dark red sunburst. It is in overall very good condition, and is complete and original except for the case – a Japanese hard shell case is included. The body and neck are solid maple, and the bound fingerboard is Indian Rosewood. The original hardware includes Schaller-design tuners with ‘Deco’ stair-step buttons, a roller bridge and block tailpiece, a pair of Hagstrom Humbuckers, pickup selector, standard individual volume and tone controls and a coil-tap mini switch. Helping with the action, a Zero Fret is installed next to the nut. This concept was first introduced on high end guitars, notably upper level Gretsch models, to ensure a consistent action and tone in the low positions. 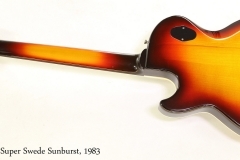 However, in the mid 1960s, low-end guitar builders realized that it also dramatically reduced setup times, and it unfortunately became associated with cheap products. Hagstrom guitars were first imported to North America by the Hershman company in New York, but re-branded with the Goya name. Many of these featured pearloid finishes and push button controls, showing a heavy influence from the accordions that Hagstrom also produced. More conventional designs took over by the late 1960’s. 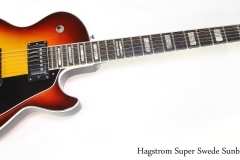 This Hagstrom Super Swede has the serial number ’53 078103 located on the metal output jack. The serial number breaks down this way: ’53’ is an internal accounting number introduced around 1970, 078 is a batch number and 103 is the production number within the batch. While little precise information is available online, it’s now known that batch 078 was completed around 1983, so we’re placing this guitar in that year. It is very likely one of the last models built prior to the end of operations at Alvaden.